Where in the Pyramid are You? Arefa Tehsin’s latest book, published by Penguin Books, is one of a kind. 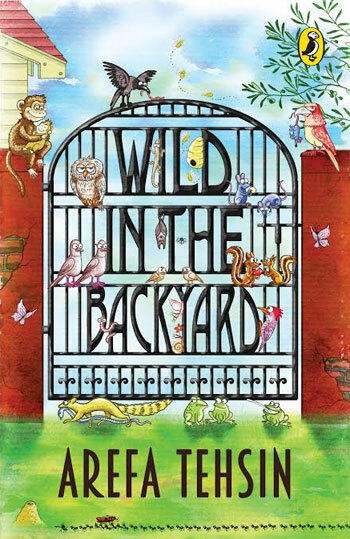 Wild in the back yard conjures up images of birds, chirpy squirrels and all the beauty they represent. But Arefa has other things in mind. She starts with a bird-I mean mammal- bat. As the evening sets in, the flapping of wings from tall trees around start and owls start coming out of their holes. How much do we know of these nocturnal animals and birds? “A baggy bagful of Bat facts” and “oodles of Owly myth” later, one is forced to look at these creatures with gratitude and wonder. Many tiger watchers who visit sanctuaries will scream if they see a spider in their bedroom. After a few “super Spider stories”, you will start looking at spiders with the respect they deserve. the pages fill up with creepy crawlies which one did not know existed in our own backyard. As we read through the rhymed prose and well chosen quizzes, we soon realize how much we owe these creatures for keeping the balance in nature. The wall -G (gecko) and untamed shrew share pride of space with the hopper gangs and the slimy and sluggish. Brief and spicy, one can finish reading the book in a breeze. For children, a lot of knowledge; for adults who are familiar with many of the creatures, again, a lot of knowledge-since most of us rarely found these creatures worthy of attention. A great offering from Arefa which is a must read for all ages.